One of Australia’s leading business and financial commentators, Peter Switzer, has been announced as the MC and a keynote presenter for the Bega Valley Economic Summit to be held on July 28 and 29. 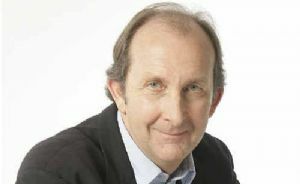 Switzer is well known as the host of his own TV show on the Sky Business Channel, as well as being a regular contributor to The Australian newspaper and national radio programs. “The Summit will highlight the opportunities for economic growth in our region, leveraging off big infrastructure projects like the Eden Wharf extension and the Merimbula Airport upgrade,” Ms Barnes said. The man himself is keen to contributing to the Bega Valley’s prosperity. “I look forward to sharing good economic news and competitive insights from some of the best business builders I have met,” Mr Switzer said. “I can’t wait to learn and hear from the great speakers listed on the program. “See you in Bega – such a beautiful part of this world,” he said. The Bega Valley Economic Summit will be held at the Bega Valley Commemorative Civic Centre on 28 and 29 July. The Summit is an initiative of the Bega Valley Shire Council. Photograph: Peter Switzer, who has been announced as the MC and a keynote presenter for the Bega Valley Economic Summit to be held on July 28 and 29.